• In The Know Is Here! Download The 1st Issue! Thanks for stopping by Shreveport-Bossier’s 1st Alternative Newspaper. 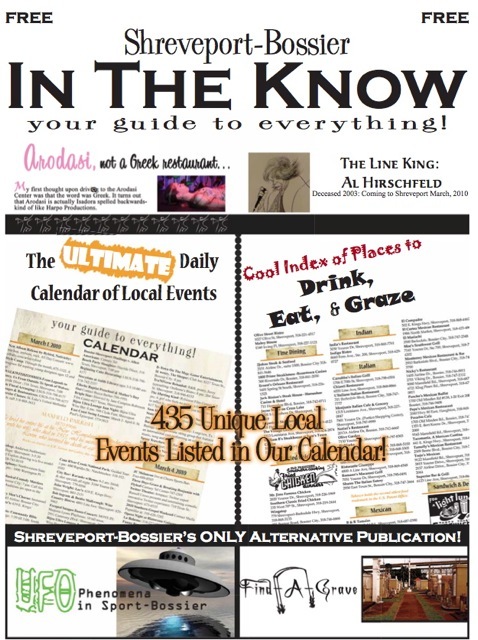 Or, click on the ‘Distribution’ link on the right-hand sidebar and find it available at over 150+ locations in Shreveport & Bossier City. ~ by Voltima on February 26, 2010. Wowed! It’s a bigger and better blast of fresh air than I even imagined!!! Congratulations to you, Alicia, and your team!!! What a wonderful, enlightening, and energizing plus your magazine is to our community and the entire happy State of Louisiana!! What a great concept for a local paper!!! Shreveport-Bossier has really needed something like this for so long…glad it is finally here!!! Way to go!! !